Simple magic that will make you the STAR. For all ages. 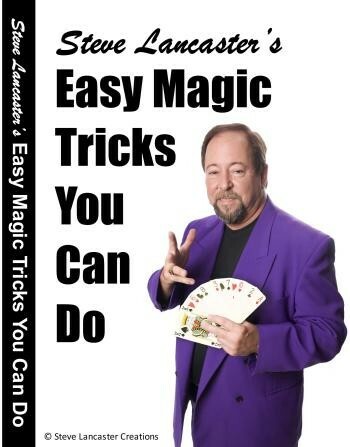 Steve Lancaster's Easy Magic Tricks You Can Do DVD Tricks you will learn on this DVD. The Torn & Restored Napkin, Mental Prediction, the Linking paper Clips, Four Ace Production, Jumping Rubber Bands, Coin through the table, Coin banish and Appearance, Levitating Pencil/Vanishing Coin, another Prediction and Aces & Kings, Bottom Deal. All the props can be found in your home and good for ages 7 and up.